Born in 1956 in Baku, he began learning the garmon at the age 16 through listening to performances of the contemporary masters of his time. Then, he developed his understanding of the Azeri maqams repertory under master Mirza Ebrahimov. 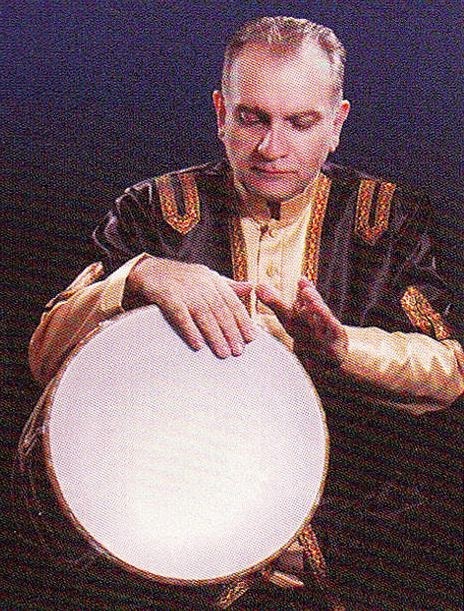 Nowadays, he is regarded as one of the most prestigious master players on the garmon in the Republic of Azerbaijan and widely performs inside as well as outside the country. There have been published a couple of his recordings in Baku. The present collection is the result of his collaboration with two Iranian percussionists. He is currently the conductor of the Oil Company of Baku Orchestra. Born in 1960 in Tehran, he learned the qaval under his brother while being 11. Then, he switched to naqqare owing to its wider range and studied it with Hushang Zive. Being a player for over 18 years, he made a trip to the Republic of Azerbaijan and extended his technical faculty under Almas Qoliev. Along with the master Safar-Ali Javid he experienced an orchestral performance and his learning there assisted him in his journey to Baku in 1998 a lot. He has so far had various tours to Canada, the United States, Germany, Italy, and France. He has achieved the first rank at Fajr Music Festival twice and appeared in the jury of Regional Music Festival in 2001. 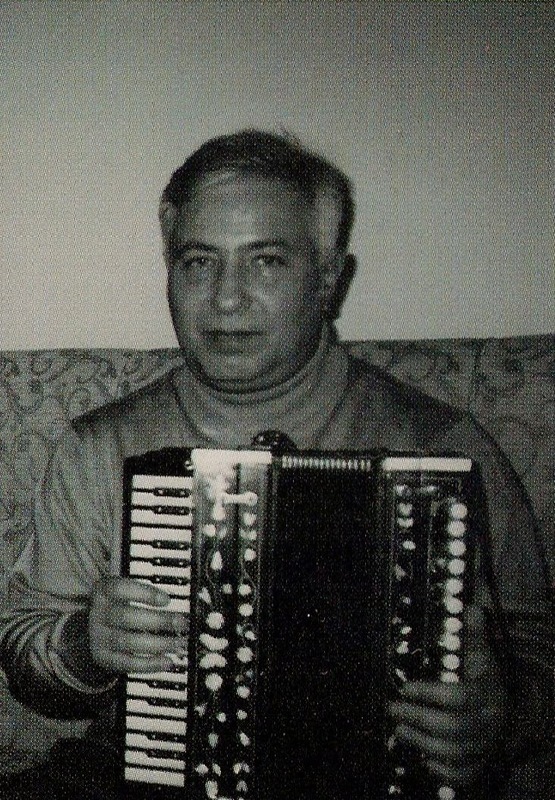 The son of Davud Ganjei, the renowned kamanche player. He was born in 1968 in Shahr-e Rey near Tehran. In basic principle of music his first teacher was his father. Then he went for learning tombak with Mahmud Farahmand. 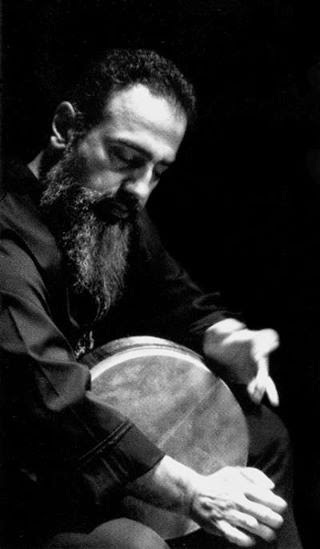 He has played in many concerts in Iran and abroad with ensembles Sama` and Mowlana. He began his teaching courses in the Center for Preservation and propagation of Music from 1987. He has attended the class of many Iranian masters such as Naser Farhangfar and Bahman Rajabi to perfect and improve his musical knowledge. 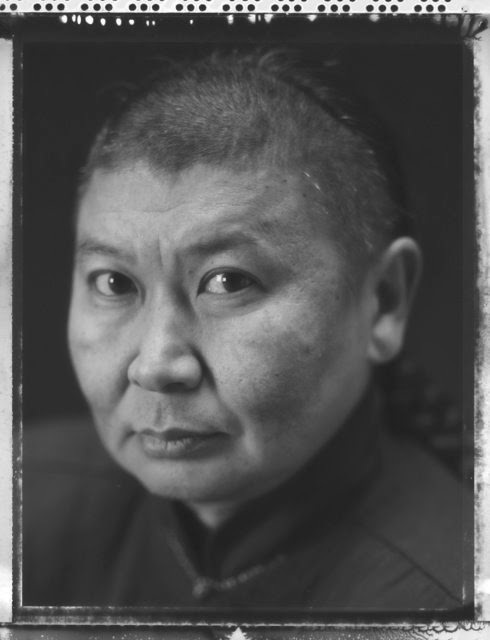 Vladimir is the national Kalmyk Djangartschi. He was born on the way home from exile in Siberia in 1957. His Russian name is Vladimir Karuev, but when he was born, his mother gave him the Kalmyk name Okna Tsagan Zam. Tsagan Zam means The White Road, in a free translation means something like “The way to freedom”, Okna is his father’s name. When he was a young boy, he had strange dreams. In one of the dreams an old man told him to sing the Djangar, but he did not want to sing, however strange forces pushed him. He started to sing parts of the Djangar epic only for friends. Then in 1987 he started to sing in public and in 1990, on the anniversary of Djangar, he received the title of National Kalmyk Djangartschi. Then he was invited to a festival in Paris, it was the start of many concerts in Western Europe and Russia, later followed concerts in Japan, India and the USA. The ‘Djangar’ is a centuries old heroic story, a source of ancient wisdom, the singers of this epic are called ‘Djangartschi’. Most of the energy of Tsagan Zam is devoted to bring the old culture and traditions back to the people. In the summer he organizes camp holidays for Kalmyk children on the steppe at Godschur. Here they learn about the Djangar and the old nearly forgotten culture and traditions, but also their own Kalmyk language, old sports like bowing, spear throwing, wrestling and horse riding. 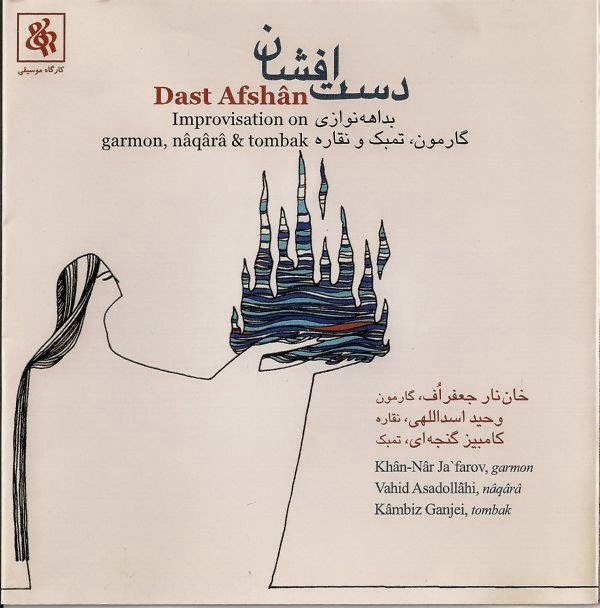 Tsagan Zan has a privately recorded CD of him singing a 61 minute version of the Djangar. 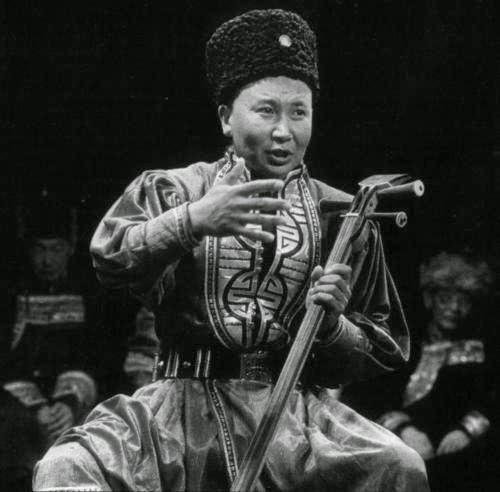 He mainly sings in his Khargiraa with some khöömei (more Tuvan style that Mongolian khöömii) interludes. Tsagan Zam accompanies himself on the Dombra (dombra) and is assisted by an unknown Morin Khuur Player. The CD of Tsagan is not for sale in shops. It can be obtained by emailing Jan Scheerder j.scheerder2@chello.nl who is Tsagan Zam’s good friend in Holland. Vladimir Karuev says how he got interested in folklore: “Once I felt a kind of blood call, as if an invisible force drove me to start collecting tales of my predecessors. I used to have dreams about my forefathers, retelling me our national folk tales. 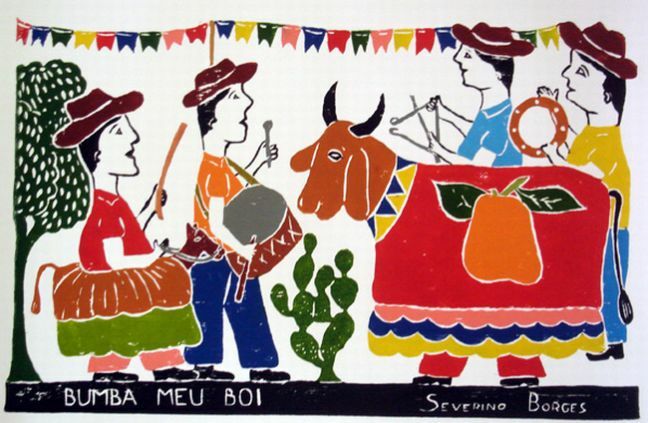 I began to visit villages and settlements and then perform folk tales, or what we call jengre tales. For me jengre is amazing wealth about which many of my compatriots have forgot”. He recently founded a cultural village at Godjur (80km North of Elista) where he raises horses and tries to collect and bring back to life various aspects of Kalmyk culture. Thanks to Karuev young Kalmyk people are studying national tales and mastering the guttural singing technique. Last year Kalmykia’s folk tales performed by Vladimir Karuev were put on the UNESCO list of the world’s cultural treasures. He became an orphan at the age of two, and began to fight around the age three. When he was seven years old, he had become a well-known hero. This is the story of the epic Jangar. Jangar was written between the 15th century and the first half of the 17th century in the Weilate region of Mongolia. A tribe of the ancient Mongols, Weilate means "the tribe of the forest". They mainly dwelled in the area of Mount Altair in northwest China's Xinjiang. The hero of the story is named Jangur, whose parents were killed by the invader, Manggusi, when he was two years old. To avenge his parents' deaths, Jangur began to go out to battle at the age of three. When he was seven years old, Jangur had established his fame and was elected Khan by locals at Baomuba. Despite his loss in war, Manggusi still attempted to invade Baomuba. Leading 35 generals and 8,000 warriors, Jangur defeated Manggusi and kept Baomuba free from occupation. Finally, with his great talents, he established a Utopia where people could stay as young as 25 years old and winter and summer would never come but spring and autumn would always stay with them. As a heroic epic, Jangur obtained great achievement in the portrait. Take the hero Jangur as an example. The epic talks about his bitter childhood and hard battle experiences repeatedly, describing him as a smart, brave and talented hero who was respected by followers. Hongguer is another big hero in the epic. It says from Hongguer one could find "99 merits of Mongols". He had boundless faith to his people and great hatred for his enemies. He had the spirit of the eagle, very tenacious. In terms of the landscape description, the epic displays not only the grand scene at Mount Altair, but also the living environment of Weilate Tribe with strong ethnic flavors, which reflects the unique characteristics and aesthetics of Mongolians. Jangur contains a lot of the oral language of Weilate Tribe, supported by the ancient Mongolian folk songs, hymns, and proverbs. 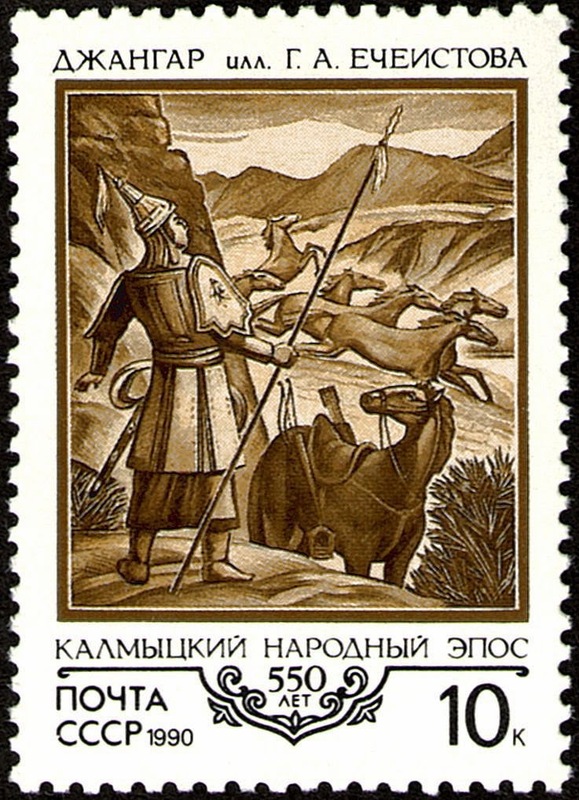 Written at the peak of ancient Mongolian literature, the epic Jangur has shown great influence on the literature of the following centuries. 1.Ode about the fight of Kervin Kioviun Monkhul with the beautiful dappled horse, against enemy fighters (fragment). Dava Shavaliev (1879 - 1944) rec. 1939. The Mongol Hero Epic Jangar is one of the three major works of Mongol Classical Literature. Jangar can be compared to Homer's Iliad in its size but at the same time it is an epic well adapted to a migratory culture, in that each chapter is a separate story within a story, allowing for a fresh start with each storytelling. The cradle of the Jangar Epic is in Xinjiang, northwestern present day China, home to the Oirat Mongols. However, the epic can also be found in areas of Mongolia and Russia, along the path of the Volga River, home to the Kalmyk Mongols. The first publishing of Jangar was during the late 1950's by the Inner Mongolia People's Publishing House, when a 13 chapter Oirat version of the over a hundred chapter Oirat Jangar Epic was published in the Oirat Mongol "clear" script. Later in the 1980's Boyinheshig, a mythologist from Inner Mongolia University, and T. Dolma, spent over one month in Xinjiang recording what would become a 15 chapter version transcribed and published in modern Mongol (Uigur-Mongol) script in the 1980's. Today, there are many different translated versions of the Jangar Epic in different languages all around the world. The main story-line in the Jangar Epic is the battle between good, Jangar and his heros; and evil, the Mangus or evil monster, and the achievment of a life of bliss. The Epic of Jangar is a masterpiece creation of the "Jangarchin", individual tellers of the Jangar Epic. 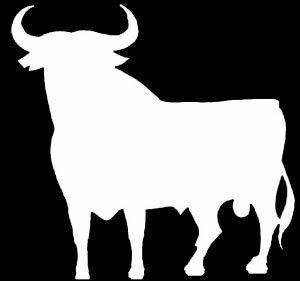 The epic has been passed down orally for ages and it is unclear to this day who created it or when it was created. Jangar was orally created by the people from Mongolian Tuerhute Tribe in the 13th century and handed down to modern times by word of mouth. There wasn't a written text until the early 19th century. Later, the epic was introduced to other parts of the country and foreign nations in Kalmyk, Todo and Mongolian texts etc. According to legend, Jangar was the son of the headman in Benba area. He had exceptional wisdom, noble character, amazing strength and excellent martial arts since young. From the tender age of seven, Jangar kept making remarkable achievements. He was later selected as khan by the people. Warriors led by Jangar gradually expanded their military power, wealth and territory. Then, they established a perfect homeland with Benba at the center. It was an area with mild weather all the year round. People there led a peaceful life filled with love and had ample food and clothing. However, the happy life led to the jealous hatred of Jangar's enemies, who targeted skilful craftsmen under Jangar, his good horses and righteous wives on their seizing sprees. Focusing on the enemies' bride-seizing, looting and meadowland occupying, the epic unfolds one heartquaking battle scene after another. This epic helps you understand the economy, culture, life customs, political systems and other aspects of ancient Mongolian society. 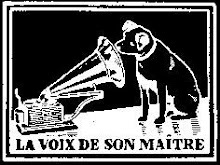 Allo, Allo, Allo Beirut - Happy New Year! The World mourns Sabah the singer, beautiful symbol of a vanished golden age. With an ‘entire past’ fading, the death of an admired diva revives memories of the lighter side of life from Cairo to Beirut. As a child in the late 1950s, the leading Egyptian theatre director Hassan el-Gueretly remembers accompanying his mother to the workshop of Pierre Clouvas, a couturier in central Cairo. Various Miss Egypts bought their dresses there, as did Sabah, the Lebanese singer and actress. For the young Gueretly, it gave a rare frisson to see the superstar’s avant-garde clothes up close. Sabah died 26st of November, aged 87, and her death prompted in Egypt as much as in Lebanon an outpouring of warm memories. At a bleak moment for the region, Sabah’s joyous career and character are reminders of a lighter side to life. Born Jeanette Feghali in a mountain village in Lebanon, Sabah took her nickname from the Arabic word for morning, an appropriate nom-de-plume for a woman adored for her sunny vitality. She moved to Egypt in the 40s and became a star of musical cinema, appearing in more than 80 films, performing about 3,000 songs, and developing a reputation for bold fashion choices. Few remember Clouvas now, and while central Cairo still has its charms, it is no longer grand, and the shops are no longer fancy. Sabah is a throwback to what, according to one nostalgic narrative, was a more triumphant era. An era not of fundamentalism but of pan-Arabism. Of a Cairo, where Sabah spent her cinematic heyday in the 40s and 50s, that housed a flourishing film industry – a Hollywood-on-the-Nile or “Niley-wood”, as Gueretly jokes. And of a pre-civil war Lebanon whose celebrities one by one are dying. If in artistic terms Sabah was of another time, in social terms she was in some ways ahead of it. Other divas of her era married and divorced several times. Sabah’s nine or 10 marriages – no one is certain which – outnumbered everyone else’s. She broke taboos with her frank and frequent pronouncements about men and desire. And as she got older she ignored pressure to hide herself away, continuing to wear outlandish outfits and date younger men. With fellow divas Fairouz and Umm Kulthum, Sabah became one of the undisputed giants of the age, building a successful stage career in Beirut after leaving Cairo for good in the 60s. 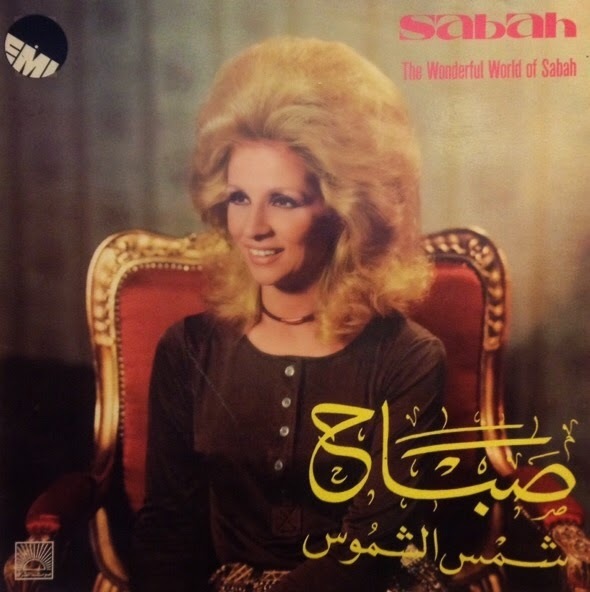 Unlike Fairouz, Sabah’s work was not political, apart from a couple of songs that dealt with pan-Arabism. And unlike Umm Kulthum, her songs were not weighty or serious. Nor was she a strong actress. Instead her vocal technique, her warmth and sincerity as a performer, and the lighter nature of her songs [Yana Yana] were what made her loved. “She had no relationship with political issues – and that’s why people needed her,” said Momen al-Mohammadi, an Egyptian author and thinker. In Lebanon itself, 30 years on, Sabah’s death is about more than just the departure of an entertainer. For Fadi al-Abdallah, a Lebanese poet and critic, it has also raised gnawing questions about the nature of Lebanese identity. “There is a general feeling that the symbols of the era are leaving, and that at the same time they haven’t been replaced by a new generation,” says Abdallah, who wrote a widely shared paean to Sabah last week.